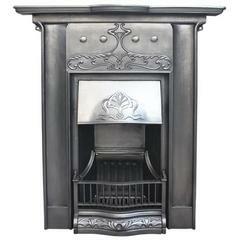 Large and unusual Edwardian Art Nouveau fireplace. The shelf with fine dentil moulding sits above a deep and decorative frieze of long flowing tendrils terminating in stylized flowers so typical of the Art Nouveau style. Below the adjustable canopy, also cast in a similar style, sits above the fire with sets of four antique Art Nouveau tiles each side. These tiles are included in the cost but can be changed if required. The basket itself sits between a pair of simple curved hob plates and behind shallow curved bars. Dated 1907. 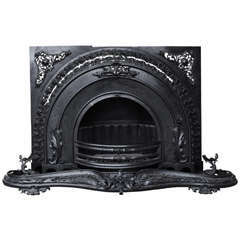 Beautiful fireplace screen made of cast iron, with decorative motifs of cat tail and arrows the fireplace screen is treated and sealed for rust. Great object of art for display.